Remember when white cotton dish towels were adorned with hand stitched embroidery? I received hand embroidered dish towels from my Grandma for my first wedding way back in 1976. I think they are so fun as the towel sayings all rhyme and all are connected to marriage. Follow ORGANIZED CLUTTER In A Reader. Follow ORGANIZED CLUTTER by Email. Follow ORGANIZED CLUTTER on Facebook. Follow ORGANIZED CLUTTER on Twitter. 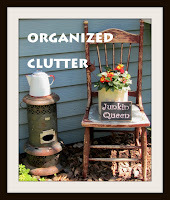 Follow ORGANIZED CLUTTER on Google +. what darling dish towels, and how wonderful to have something made by your grandma! I still love to find old dish towels like that. I always look at yard sales, and thrift shops. Those are so cute! I remember embroidering little puppies and flowers with my Gram. Wonderful memories. Well, the marriage didn't last but the tea towels did!! Adorable; love the colours!! Carlene those are some of the cutest dish towels!!! Love them! Gosh glad you still have them! Adorable! I love those embroidery towels, my Grandma gave me some and I used to do emboidery ages ago. Found your blog through Pinterest. Your dish towels are so charming! I got a set from Bill's grandmother when we were married, too. My daughter got a box full of embroidered towels for her wedding from her husband's grandmother. Hippos, elephants, and bears. Hmmmm. Not exactly what you think of for a kitchen! These are so sweet, Carlene...and even more special being from your grandmother! I am a sucker when it comes to rescuing embroidered dish towels. Especially ones like you received with a theme for the set. I am loving your grandmother's gift to you! They are so sweet and adorable! Each one is so special. I have loved these designs since I was a child. Such a treasure! How I love embroidered tea towels. My gramma made several for me for my hope chest as I was growing up. I actually have a few that are from the same pattern with the cats. I just love them. Thanks for sharing so many wonderful treasures, Carlene.